2020 is based on making our province an authentic tourism destination that will attract visitors from within Canada and abroad based on a brand of market ready indigenous tourism products and services. It’s time to make Aboriginal tourism a priority in Ontario by launching and supporting an independent organization that is completely dedicated to positively reshaping our province’s future for indigenous tourism. The time is now! Our 2020 Vision is built on stakeholders who have overwhelmingly supported a single organization dedicated to building aboriginal tourism in Ontario. Our collective vision supports an organization that will ‘responsibly develop, market and grow Ontario’s indigenous tourism industry with values and integrity.’ We will ensure our growth adheres to responsible tourism guidelines that promote sustainability, environmental stewardship, innovation and technology. is to assist indigenous communities and entrepreneurs with programs that build capacity to produce high quality products and services. Our success will be guided by the positive impact on our people, the environment and the economy. For our welcomed visitors and tourists we will ensure that our products and services provide a meaningful and memorable indigenous experience. in utilizing an innovative grassroots approach; in attracting investment & develop partnerships; and implementing ATO 2020 key initiatives. Many people are looking for travel opportunities to become more involved with the community and to actually make an impact while they visit. Volunteer travel experiences open new doors for creating amazing experiences for visitors while benefiting the communities that they visit. Amanda Huculak, part of the CES team, also is the Co-Founder of Travel Roots, a socially responsible tour operator that designs unique adventures across the globe and is also involved with volunteer travel. She recently returned from leading a group volunteer adventure to the Maldives and this experience demonstrates that you don’t need to have much to get started in volunteer travel opportunities. In this day and age it’s always a hard task to find untouched travel experiences… as a grassroots tour operator Travel Roots is always looking for those destinations or local partners that offer authentic experiences and something different from the usual travel adventure. Most of their partners are smaller grassroots businesses that really need the support of an outside organization in order to take their business to the next level and they are proud to support these types of initiatives. Using this approach they connected with Huvadhoo Aid, a not-for-profit located in southern Maldives in the Huvadhoo Atoll. They strive to bring peace, prosperity and progress to the local communities and they have opened their doors to accepting international volunteers to help with various community development projects. Sure there are some growing pains and a few hiccups along the way, but with continued organizational development and training there are a lot of great opportunities that lie ahead for Huvadhoo Aid’s volunteer program. Amanda visited the organization’s home community of Hoadedhdhoo January 2015 and loved the concept of an authentic community-based experience in the Maldives. She then decided to recruit a group of volunteers from around the globe to participate in a 3 week volunteer excursion August 10 – 31, 2015. It ended up being quite an amazing and unique adventure. She was so happy to see the group of volunteers create such a strong bond and kept a very open mind during the trip despite a lot of changes in the itinerary and having to adapt to the local realities. Upon arrival, they instantly had to adjust into the ‘island’ lifestyle which involved slowing things down – sometimes a little too slow :), changing your diet to mostly fish and rice, dealing with the elements like the heat, the rain, the bugs, and the marine creatures, and dealing with the Maldivians extremely laid back demeanour. A typical saying in the Maldives is ‘no problem… we can arrange…’ and ‘why not!’. They really try to go out of their way to give you the local experience. Since there is no tourism on the island, everyone is treated like a local and some of her favourite moments were just walking around the community and getting to know the locals. Every day between 4 – 6pm the community would be out playing sports or hanging out at either the jetty or the football field. This is a great time to bond with locals, whether it’s playing volleyball, football, or bashi – a local women’s sport similar to tennis but played a little ‘backwards’. In addition to experiencing life in the community they got a chance to explore the nearby uninhabited islands and went snorkelling, wakeboarding, fishing, and we even spent the night on an uninhabited island that was managed by Zakir, a kind Bangladesh man that was stationed there to be a guardian for the island and try to earn money to send home to his family. He was such an amazing man and made sure they were always well taken care of while they were on his island. What made this trip so special, was that it attracted such an amazing group of individuals from around the world! Their wonderful spirit of volunteerism and a willingness to learn about a new lifestyle and culture was so beautiful to experience. So this experience proves that volunteer travel can be a rewarding experience if done responsibly. For advice on how to get involved with volunteer travel contact Amanda at amanda@cesclients.com. More and more tourists are searching for experiences that connect them to diverse cultures in an unplanned spontaneous way that seems authentic and genuine. Traditional travel adventures such as mass market bus tours, the all-inclusive resorts, and jam packed travel itineraries are becoming a thing of the past. People are looking for something more different… more authentic.To encourage more authentic cultural tourism products CES first developed the Spontaneous Tourism Model™. This model represents a managed version of the type of tourism activities that are taking place in many indigenous communities throughout the world already – a visitor calls the Community Tourism Office, expresses an interest in various activities in the community, and the Tourism Officer recruits Guides/Tour Delivery Agents to facilitate the request – or sometimes lead the activity themselves. These activities are considered ‘static’, meaning that the opportunity to deliver them exists regardless of whether or not an entrepreneur chooses to build a business around one of them. Using the community’s resources, infrastructure and technology, this model becomes an incubator for new products, entrepreneurs and new and existing businesses. This approach allows local individuals to offer unique tourism experiences without the need to quit their job, develop a business plan or take the risk of opening a new venture. 3. Experiences are created by ‘Independent Insiders’ – artists, designers, foodies, teachers, photographers, guides, Elders and everyone else can create and operate their own experiences. Each Independent Insider creates, curates, and takes on full responsibility for the experiences they offer. Vayable is the platform and a resource – they do not run or host the experiences. Anyone can create an experience on Vayable as long as it meets their guidelines. 4. People have been travelling this way for generations – provide opportunities for individuals who aspire to enrich their understanding of the world and themselves. 5. Providing long lasting meaning and fulfillment from experiences – the survival of the tourism industry relies heavily on the communities that sustain it. For many countries, tourism presents the greatest promise of prosperity and economic mobility. Vayable provides these communities with a new, safe and fun way to accomplish this. 6. Participants help individuals support their passion while sustaining a culture and building a community – visitors have an opportunity to help empower local entrepreneurs to earn a living from their passions, knowledge and skills. This results in creating a positive impact on the community by helping to keep culture alive and bringing local commerce to neighbourhoods and towns that may otherwise not have access to capital and traditional tourist centres. The ‘local insider’ is responsible for designing the experience and personalized profile that is shared on the website. This personalized approach begins to create a connection between the visitor and their guide before they even go on the tour. As far as standards and guidelines go, it is kept pretty simple. Anyone with unique knowledge, skills or access can earn money offering an experience as a Vayable Insider. The only thing that Vayable enforces is that all Insiders offer quality well fleshed-out experiences and have safety precautions for visitors. The ‘local insider’ is responsible for designing the experience and personalized profile that is shared on the website. This personalized approach begins to create a connection between the visitor and their guide before they even go on the tour. As far as standards and guidelines go, it is kept pretty simple. Anyone with unique knowledge, skills or access can earn money offering an experience as a Vayable Insider. The only thing that Vayable enforces is that all Insiders offer quality well-fleshed out experiences and have safety precautions for visitors. It’s models like this that are celebrating authentic experiences and something different from the norm. These models focus more on creating a genuine relationship with the visitor and the host. 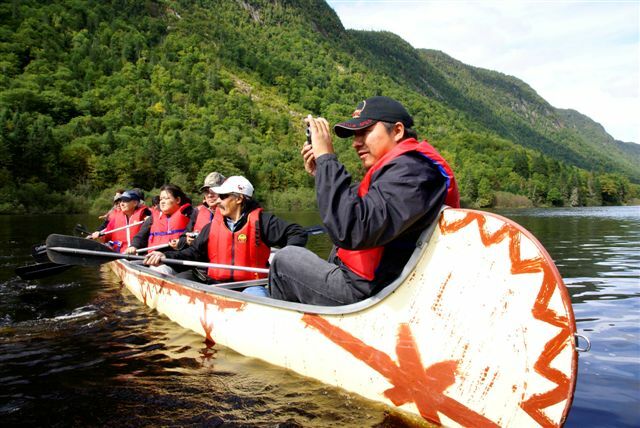 CES is currently working on developing a strategy for Aboriginal Tourism Ontario that strongly recommends pursuing an approach like this to develop authentic indigenous tourism products throughout the province. This innovative model will change the future of indigenous tourism development and focus on empowering local community members to share their culture and do what they are passionate about, whether it is guided experiences on the land to learn traditional survival skills, how to make the best bannock, or sitting around a fire telling stories and legends of the past. CES looks forward to seeing what the future holds for innovative tourism ideas! For more information on this concept contact info@cesclients.com. Cost-conscious consumers have limited cash flow and view collaborative consumption as a way to save money while travelling; whereas the non-travellers can make money and reduce their cost of ownership by renting their home, rooms, cars, etc. To summarize, the above research indicates that there is a definite growth in young travelers, individuals seeking ‘authentic experiences’, individuals wanting to partake in local customs and culture, and individuals travelling as a family. It is also evident that travellers today rely heavily on technology through all stages of their trip including planning, booking, during and afterwards. So for all of you tourism businesses out there ensure that your marketing efforts reflect these new trends and if you need more info on setting direction for your marketing strategies contact info@cesclients.com. ATT: Tourism Entrepreneurs, Community Leaders, EDO’s! Want to enhance tourism opportunities in your community? Participate in the Community Tourism Program to get an assessment of the tourism potential in your community!